I haven't been posting recently. No big reason why other than I've been pretty busy. But I've been reading a book recently that has greatly affirmed me as well as challenged me. It's published by Zondervan and here is their website on the book. If you would like to read an excerpt, click here. This excerpt is actually the beginning of the book. Bell often returns to this image of the trampoline. I'm not sure how to review the book. I usually avoid proof-texting these days (pulling a single statement out of a book and using it to make a point) because it can lead people astray out of context. But I will here. The statements I've selected will at least give a taste of Bell's writing style and heart. I'm pretty sure I've heard statements like this before. But Bell's context in the first chapter is that we use and abuse doctrine these days to the detriment of ourselves and our (God's) message. A statement that may seem profound at first, but I believe is true. Bell asks us to look at the Christian faith as a growing and emerging thing. A question for reflection from me is: Does God grow? Do we play a part in who God is? This is in relation to the trampoline as an image for the Christian faith. Inviting someone to join this Christian faith is: ...the statement above. One of his points is that to "accept Christ" is not to have it all figured out. To accept Christ is not an act that prerequisites that someone have their life in line and perfect. This is one statement with which I still have questions. I believe that what we say is certainly commentary...I'm just not sure that God has finally spoken. He has said...but he has more to say. I have felt this way for a long time now. Can we please stop throwing individual phrases from the Bible at people thinking that the act of doing so will dramatically change their lives? I think St. Francis of Assisi said something to the effect of my feelings here. I'll let you Google for it. I'm sure it's his most-quoted phrase. Let me couple this with the statement above about how God is bigger than the Christian faith. Jesus is God and I also believe is bigger than the Christian faith. Then how can I (or anyone else) think we have Christ completely figured out? I can't. Christ is bigger than me. I am his servant and as a minister of his gospel, I always have to keep an open mind to different ideas of what he has done, what he is doing, and what he will do. WOOHOO!!! Go ROB! Just because someone - you, me, CBD, TBN, Pat Robertson, a denomination, or anyone else - labels something "Christian" does not mean that it is "following Christ." Let's be careful, people. Just the same, just because something is not labelled Christian does not mean that it does not fall in line with Christ. Or, just because an individual claims the title of "Christian" does not mean that they are following Christ in what they say or what they do. Just an interesting thought. I'll not make commentary right now. Can we stop paralleling the church (local OR general) with the business world, please? "Heaven is full of forgiven people. Hell is is full of people God loves, whom Jesus died for. The difference is how we choose to live, which story we choose to live in, which version of reality we trust. Wow. This resonates with how a character in McLaren's book (A New Kind of Christian), named Neo, talks about heaven and hell. One thing he says is, "We are becoming on thsi side of the door of death the kind of people we will be on the other side." I read Velvet Elvis and am truly saddened to see how far Rob is heading down a slippery path theologically. My concern for his distain for "doctrine" in it's true form, that of the foundation upon which the church of Christ is built, is great. To compare doctrine with the springs of a trampoline? Hello. And then suggest that our understanding of doctrines could be distorted, such as the Virgin Birth of Christ and others he mentions, is frightening. I must have a different Bible. Mine says Christ is the ROCK upon which we build...not a trampoline upon which we jump. Rob would agree with you, I believe...Jesus is the foundational rock upon which the Church is built. But we can't equate doctrine with Christ. 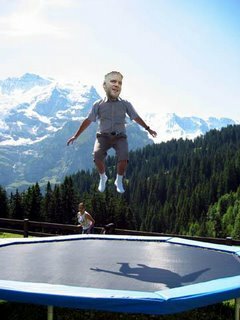 I don't believe that Rob ever said the trampoline represents Christ. It represents our faith in Christ. If someone has faith as solid as a rock, I admire him/her greatly. But I honestly confess that my faith is not rock-hard. I'm trying...but I'm not there yet. So I'll continue to try and add springs to my faith to make it sturdier and stronger, allowing me to jump higher and higher. I could say a lot more, but I'll just say this for now: Read the book.